We are on the eve of Kenya’s second try at the presidential elections this year. The first round was in August… we stocked up on food and water, filled our car with gas, got our go bags ready… and then it was over, with Kenyatta being named president for his second term a few days later. The opposition party refuted the results of the election and petitioned the Supreme Court. The Supreme Court ended up ruling that the elections were fraudulent and mandated a new election on October 26th. So, election day (again) is tomorrow! Tensions are so high right now. We are almost too tired to gear up for another election, but we forced ourselves to at least somewhat prepare. Once again, most of our interns at the hospital have gone to their home areas to go vote, or at least to go be with their families. The work at the hospital depends on those of us who live in Kijabe as most everyone else is gone. We are bracing for some very long days and nights. This is all on top of the continued national nurses’ strike (over 140 days now) which makes our patient numbers really high. It’s so difficult to explain, but the months of not-knowing and the tension in the air is literally exhausting. We just feel tired all the time. 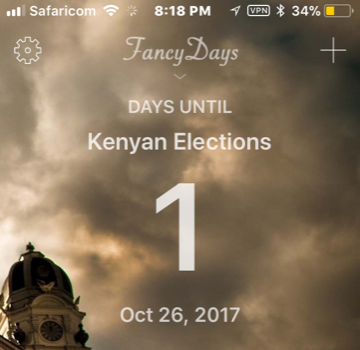 Will you pray for the country of Kenya as they make history tomorrow by having a repeat presidential election? Although peace does not seem possible at the polls tomorrow, we know God can work a miracle. Please also pray for our family. We are worn out. Thank you for praying. We will try our best to keep you updated on the election tomorrow, depending on how things go. This entry was posted in Uncategorized by Allyson Smith. Bookmark the permalink.